The mass majority of feeds are pelleted, which means that they require to go through a pellet mill or a pelleting press. Inside the pellet mill the most important part for producing the pellets is the pellet die. This is the part that the mixed mash feed formula is pushed/pressed into small holes in a die. The result is pelleted feed coming out of the other side of the pellet die. L = Effective Length: The effective length is the die thickness that actually performs work on the feed. See the picture on the right for actual positioning on a die. I.D. = Inner Diameter of the Die: The inside diameter is the most common identifying dimension of a die and is always specified during die selection. O = Overall Width of the Die: The overall width of a die may vary. Often, there is more than one width available for each die diameter. W = Working Width: Die working width is measured between the two inside edges of the die grooves. Die working area is the area inside of the two die grooves. As the pellet dies' width and diameter so to does the working area. The die working area is very important as different feed ingredients and feeds require a specific time inside the die holes, known as die retention time, in order to be able to bind together and form pellets. With larger working areas on dies there is greater retention time to form pellets, which in turn reduces power consumption per tonne of feed pelleted and helps to improve production efficiency. L/D Ratio: The L/D ratio is the effective length (L) divided by the hole diameter (D). High L/d ratios provide high pellet die resistance as feed moves through the hole. Low L/d ratios provide less resistance. Each material has an L/D ratio requirement to form the material into a pellet. I=Cube inlet diameter: The diameter of the inlet where the feed enters the compression area of the pellet die. Different configurations of the inlet (countersinks, tapered inlets, well inlets, etc) can be used to achieve extra compression if needed for particular materials. N=Inlet (well) depth: The depth of the inlet into the pellet die. C=Degree of taper (Choke): The degree of taper, also refer to as the choke. This degree is important as it determines the force to which the feed material is pushed into the pellet compression area. F=Total depth of well and choke: This measurement is the difference of the effective length and the total thickness of the die. 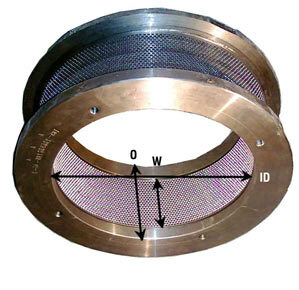 It is the depth of the feed travel in the inlet to reach the effective pellet compression area. Holes in dies typically are drilled in three different patterns. - Close-hole pattern spacing provides more open die area and more retention time. The open area of dies with close-hole patterns is about 43 percent. - Wide-hole pattern spacing provides less open die area and greater die strength. Wide-hole pattern spacing provides about 32 percent open die area. - Standard- or medium-hole pattern spacing provides a compromise between die open area and die strength.